Oh my — it has been quite a while since I have participated in Beth Fish’s weekly meme, although I try to read all the posts of those who faithfully contribute. Since I am now officially on Christmas break, however, one of the first things that I want to do is reconnect with my blogging friends. So I figured what better way to do that than to share a favorite holiday recipe with all my online readers. Ever since I was a little girl I remember my mom making Bishop’s Bread each December. When I was about five years old I would “help” by cutting the cherries in half with a pair of scissors, and then cutting the dates into thirds. My hands would be sticky and I am sure that I made more of a mess than I actually helped, but I fondly remember taking part in this Coleman tradition. My father loved Bishop’s Bread, so Mom would always make two: one for Christmas and one to freeze for my dad’s birthday in February. The bread is so dense that it freezes wonderfully and tastes just as good thawed two months later as it does fresh out of the oven. I have no idea where Bishop’s Bread originates. I am sure that Mom found the recipe in a magazine – although the original source has been lost for quite some time now. It is reminiscent of fruitcake, but make no mistake, this tastes like no fruitcake you have ever eaten. The combination of dates, walnuts, candied cherries and chocolate chips, bound with just enough flour to hold it together, makes for an irresistible dessert or early morning pick-me-up with a strong cup of coffee. I hope to make at least two loaves this week keeping the tradition of eating one now and freezing another for after the new year. Should you decide to try this as well, please let me know how you what you think! This looks dense and moist and full of winter / holiday flavors. I love dates, so I bet I'd really like this bread too. And thanks for the freezing information — I love knowing that I could make this ahead when I have time and thaw and serve when I'm in a rush. This bread is what I've been looking for. My mom always made regular fruitcake but I don't like that fruit stuff that's in it. I like dates and cherries so I know this will be so much better. 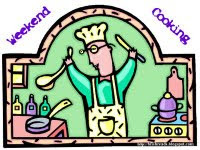 So glad you are back to Weekend Cooking. I missed you and your food-talk. However, don't feel guilty as you are doing important work. Bishop's Bread was worth the wait. it does sound like fruitcake..except for the chocolate chips. I too love dates..and walnuts…and everything in it! Sounds and looks really good. I think it would go great with a cup of coffee! This sounds quiet delicious, Molly, and I will have to make some, if not next week, perhaps sometime soon. I can almost taste this with that strong cup of coffee you mention. Tomorrow, Sunday, I start my baking. how nice for you to be on vacation! my private school has a bit of a different schedule and i don't have a big break until mid-january (2 weeks). as for bishop's bread–i've never heard of it but LOVE candied cherries. what a nice tradition for you to carry on. wishing you a wonderful holiday season. hope you enjoy your break and recharge before the start of the new year! Thanks for the recipe, this is going into My Favorites! Thank you for sharing the recipe with us. I'm glad you are enjoying your holiday!